The UNC Greensboro men’s basketball team has earned the No. 1 overall seed in the National Invitation Tournament and will begin postseason play Tuesday night against No. 8 seed Campbell at the Greensboro Coliseum. The game will tip at 7 p.m. and be televised on ESPN3. The Spartans earned the top seed in the NIT after narrowly missing out on the Southern Conference’s first-ever at-large bid into the NCAA Tournament. This season, the Spartans won a program-record 28 games and went 15-3 in the SoCon for the second-straight year. 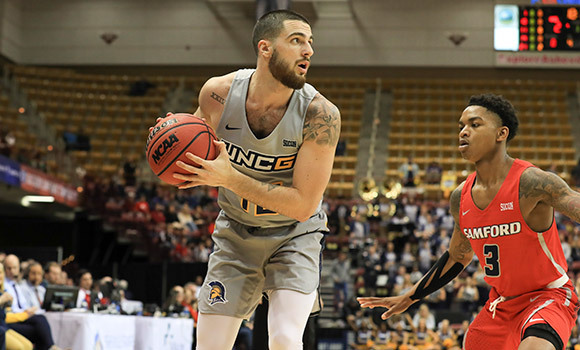 Along with winning the most non-conference games in program history (11), UNCG also set a new single-season record for consecutive home victories (17). Tickets for Tuesday’s match-up can be purchased for $12 at this link. UNCG students with a valid Spartan ID will receive free admission and can purchase $4 tickets for their guests. Discounted guest tickets must be purchased at the UNCG Ticket Office today from 9 a.m. to 5 p.m. and tomorrow from 9 a.m. to 2 p.m. All seating is general admission, and doors will open at 6 p.m.
Students are invited to a tailgate courtesy of Taco Mama at 5 p.m. at the coliseum. Shuttles will provide free transportation to and from campus and will begin picking up students at 4:45 p.m. in front of Elliott University Center and Spartan Village. Second-round NIT games will take place March 21-25 and the quarterfinals will be March 26-27, both at campus sites. The semifinals on April 2 and the championship game on April 4 will be played at Madison Square Garden in New York. To read more, visit uncgspartans.com.